Ever since two cavemen started beating sticks on hollow logs it has apparently been the goal of musicians to be louder. Symphony orchestras, Celtic, Polka, bluegrass, country, rock and roll and sometimes-even jazz, strive to amp up the volume. Now I love nothing better than to have my eardrums blown out by great live music, but not long ago I found myself on a road, miles from any sign of human inhabitation. I stopped my car and stepped outside. The quietness was deafening. A rushing white noise, phase shifted through my ears, like the beginning of some bad rock song from the 1970’s, but after a few minutes I started picking out the chirping of birds and insects. A minute later I could hear the leaves of trees rustling in the slight breeze. I was amazed at the complex audio beauty of a seemingly silence place. The same thing happened to me the first time I saw Jesse Sykes and the Sweet Hereafter. There are few bands in the world as quiet as Jesse Sykes and the Sweet Hereafter. You can literally hear a beer glass fall on the floor while they are performing. 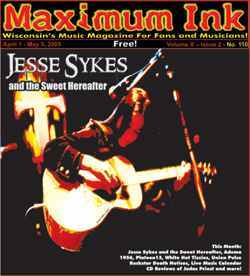 Jesse Sykes and the Sweet Hereafter performs on April 5th at Minneapolis’s 400 Bar, April 6th at Cafe Montmarte in Madison and on April 7th at Shubas in Chicago.